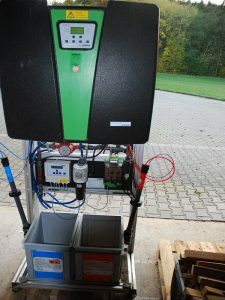 Chlorine dioxide plant, make Grünbeck, type: GENO-Baktox Pro, for ~ 10.000 lt/h water, for quick disinfection of drinking water/using water through addition of chlorine dioxide which is produced at site through GENO-Baktox red and blue, built 2010, fully functioning, without water counter and contactor, ex location for 7.150 €. 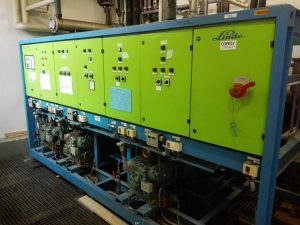 NH3 cooling plant, make Linde, type: LBR 3300 A, for 151 kW refridgerant capacity, volume each compressor68,5 – 133,4 m3/h, each 900 – 1750 U/min, consisting of: 3 compressors with control, complete built on frame, 4 evaporator, 1 colleting vessel, 2 cold bearer pumps, 1 glycol vessel, built 1995, operating hours each compressor ~56000, yearly maintained, fulli functioning, partly dismantled. 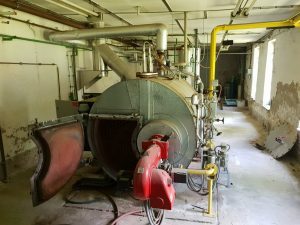 Cooling compressor, make Bitzer, capacity volume 12,7 -28,6 m³/h, 310-700 U/min, 19/23 bar, medium 134 A, built ~2006, ex location for sale. 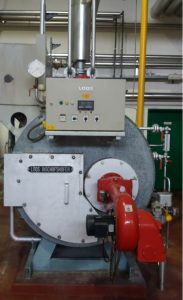 Water degassing, make Cadalpe, type: Deareatore, for 3 m³/h, for degassing up to 20 ppm/O2, in stainless steel, assembled on frame, with tank in s/s, 2 pumps, internal s/s-piping and fittings, s/s control cabinet, built 2017, Measurements: L: 1.750 mm, W: 1.110 mm, H: 2.110 mm, ex location for 9.000 € for sale.